What a beautiful morning we had for once, in the 60s and beautiful blue sky. A great start to the day and weekend. It's supposed to get boiling hot again soon so I am enjoying it while I can. The image today is of my neighbor's Balloon flower. I shot this last year and just recently found the images and liked this one a lot so decided to share today. 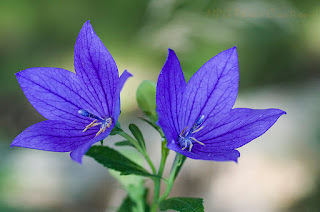 They are called Balloon flowers because before they open, their buds swell to balloon shape and then the petals break apart.